Does Oat Bran Contain Gluten? Gluten refers to a number of storage proteins that form in grains as they grow in the field. Barley produces hordein, rye creates secalin, wheat forms gliadin and rice produces a form of gluten known as oryzenin. If you have celiac disease or CD, you’re well aware that your body develops an autoimmune response to the gluten in barley, rye and wheat. However, oryzenin from rice doesn’t cause this problem. If you have CD, your body launches an attack whenever you ingest some forms of gluten. In the process of this attack, there can be significant damage to the villi -- the little finger-shaped projections on the inside wall of your small intestine. Over time, the damaged villi become less effective at absorbing nutrients from the gut and you become malnourished. White rice flour is produced by finely grinding white rice, and makes an excellent gluten-free substitute for wheat flour for people with CD, says the National Foundation for Celiac Awareness. The Celiac Sprue Association confirms white rice flour is gluten-free and lists other gluten-free white rice products such as japonica rice, instant rice, precooked rice, jasmine rice, long-grain rice and risotto. 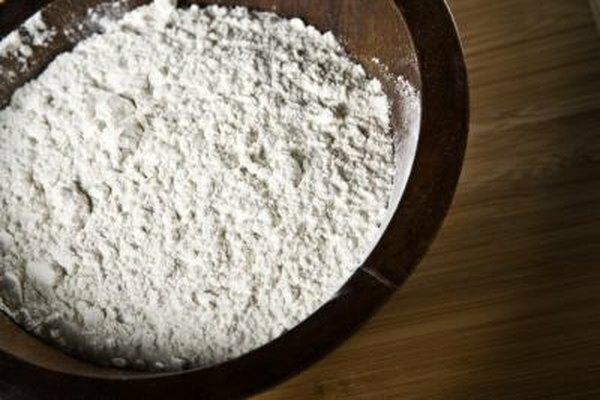 The Celiac Sprue Association publishes a number of flour recipes you can use to create gluten-free baking mixes with white rice flour. For general baking, combine 1 cup of rice flour, ½ to ¾ cup of potato starch and ¼ cup of tapioca starch or tapioca flour. For a feather-light gluten-free baking product, mix 1 cup rice flour, 1 cup cornstarch, 1 cup of tapioca flour or tapioca starch, and 1 tablespoon of potato flour. When you’re shopping for gluten-free grains, do your homework. Even though white rice flour is gluten-free, it can be contaminated during the manufacturing process. Check directly with the manufacturer to ensure a particular brand has been ground and packaged in a gluten-free environment. NFCA also maintains an extensive online listing of gluten-free brands, vendors and online markets to make your search a little easier. Once you’ve found a gluten-free white rice flour, store it in a cupboard away from products that contain even small amounts of gluten. Clean food preparation surfaces carefully; make sure baking pans aren’t contaminated with wheat flour or other gluten-containing ingredients and serve gluten-free foods on separate plates.